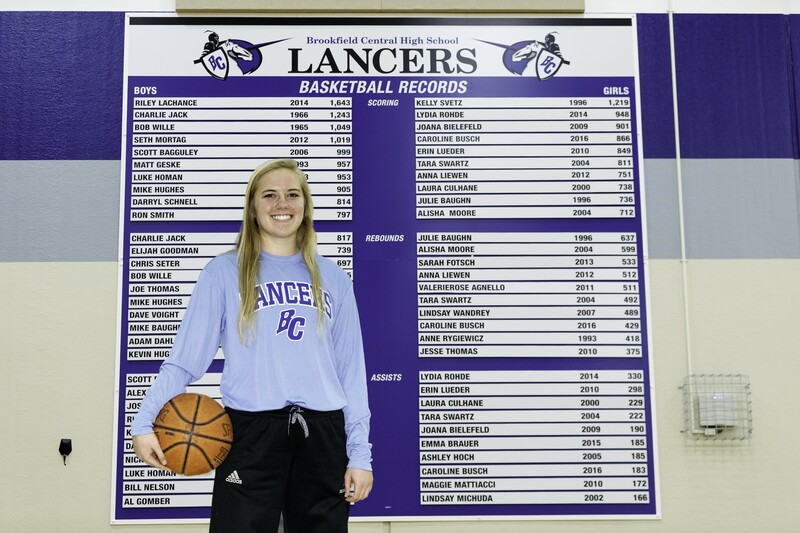 Head basketball coach Mallory Liebl was very familiar with Brookfield Central star Caroline Busch when the former Divine Savior Holy Angels assistant took the Lancers job three years ago. Liebl not only had the chance to observe the talented Busch at the high school level, but she also coached her with the Wisconsin Impact club team in seventh and eighth grade. "I first saw her in seventh grade, but I coached a different club," she said. "It was a really big plus for us my first year here. I already had that relationship with her when I was at DSHA and she was a freshman here. We would talk all the time when we were on vacation or after a game I watched her play, if I was scouting. "I put a lot of trust in her (when Liebl came over to coach Central) and she had a lot on her shoulders. It made the trust come a lot faster." Busch has put together an outstanding career at Central, ranking fourth in scoring and eighth in rebounding and assists going into this season. She also holds the school single-season 3-point record with 69 points, set last season. "I was a little bit surprised at the amount of responsibility she had to take on as a freshman," Liebl said. "I thought she did a really, really good job. She was a shooter from the beginning, but she had to be a point guard at other times. "I have always thought very, very highly of her as a leader. Someone who doesn't back down ever. One of the three toughest kids I've ever coached." Busch moved to Wisconsin from Michigan when she was 7 years old. When she was 4-5 years old, she and one of her friends were put on a rec team made up of all boys. "We were the only two girls on it," Caroline recalled. "My dad was the one of the coaches. I held my own." After moving to Wisconsin, she started playing in the Jr. Lancers program in fourth grade. "One of the things that got me to love it was that our team was so close," she said. "We still have five girls from that team playing varsity right now (including her twin sister, Elizabeth). The team chemistry that we had was a big thing." Although she has a more rounded game now, Busch is more well-known for her long-range shooting. She had 34 3-point shots as a freshman and then set the school record with 64 as a sophomore before breaking it again last season. "That's what a lot of people have known me by," Busch said of her long-range shooting. "A lot of the other stuff I do goes under the radar. When I was younger, I was always one of the smaller players on the team. (Outside) shooting was one of the things I worked on more instead of shooting in the post. "I always turned to shooting more. I think freshman year was when I got the confidence and figured out I was a pretty good shooter when I took the role of point guard. I think that was when I really got the confidence in my shooting." As a freshman, Caroline averaged 6.0 points per game and was second on the team in 3-point shots and 3-point percentage (.405) to all-star guard Lydia Rohde (58, .492). 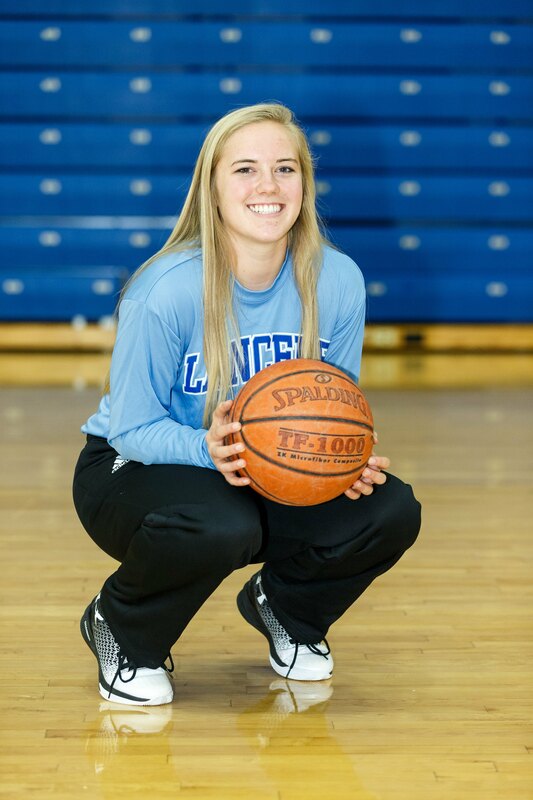 Her switching to point guard made the Lancers better, so the talented Rohde could move to the No. 2 guard position and focus on her scoring. Central finished 21-5 and 11-3, tied for second in the Greater Metro Conference her first season and she earned honorable mention recognition. Then her sophomore year Central finished 16-9 and 10-4, tied for second in the GMC in Liebl's first season as coach. Caroline led the team in scoring (14.5 ppg), field goal percentage (.542), free throws made (67), free throw percentage (.817), 3-pointers made, rebounds (6.6), assists (2.6) and tied for first in steals (1.3). She was second in 3-point percentage (.496). She earned first-team all-conference for her performance. Last season Central was 19-6 and 11-3, second in the GMC and Busch earned first team all-conference once again. She led the team in scoring (13.8), 3-pointers, 3-point percentage (.457), rebounds (6.7), assists (2.7) and steals (1.4). Liebl points out there is much more to Caroline's game than just shooting. "She can definitely shoot the ball," Liebl said. "But I don't think she gets enough credit defensively. Her rebounding last year - she was one of our rebounding leaders. She will hustle all the time. She's becoming more of a playmaker for us, which is huge; we need that. Just all-around, she's a really, really, good, solid player." When Busch was asked - besides shooting - what did she think her strength was, she had an interesting answer. "One of my main strengths is how I hold myself on the court," she said. "A lot of people tell me whether I'm playing really well or playing really bad, I just look the same. I never get too high with the highs or low with the lows. Just being able to play through all types of situations is one of my strengths." Both Liebl and Busch were on the same page when asked what Caroline needed to work on. "She is becoming more of an offensive threat from inside the 3-point line," Liebl said, "which she knows she has to do. She knows she's going to have to get to the basket and become a scorer from inside. Being able to handle the pressure of being guarded closely she is just going to continue to get better at all levels." Busch agreed with her coach on what she needs to work on. "I want to be able to drive to the basket to go all the way or pull up and hit a jump shot instead of just looking for the 3-pointer," she said. Liebl talked about her two-time captain's leadership skills. "From my perspective she's a quiet leader," she said. "She is not a quiet person. But she leads by example. She is the kid I get on the most since I have started coaching her. But she shows how to take a coach pushing a kid. "When she needs to speak up, she'll speak up. But she's definitely not the most vocal person. She leads by her actions." Busch admits she does lead by example. "I'm definitely more the quiet and reserved leader," she said. "I will definitely try to lead by example. I'll be vocal sometimes, but I'm not always telling people what to work on. If I see something they're doing wrong that I can help fix, I'll do that. "In spring practice some of the new girls would get confused and come to me or the other seniors. Claire Haynes is our other captain." Busch has been happy to see her hard work pay off. The Lancers are 56-20 (.737) overall and 32-10 (.762) in Caroline three seasons. "Looking back at the past three years and looking ahead to this year, it definitely makes me happy and excited to see all the hard work, the time and the commitment to this sport is so far paying off for the most part. I'm just looking forward to seeing what this year can hold for me and my team, so I'm excited. Busch has not doubt what her and the team's goal is this season. "One of my goals since fourth and fifth grade is to make it to state," she said. "That is my main senior goal and I think that is the team's main goal. Just work hard, practice hard and make this happen." So what does Busch have to do for the Lancers be successful according to Liebl? "Everything," she laughed. "She needs to continue to believe in herself, her ability that she brings to this team. Not putting so much pressure on herself. Just being the player she is, the leader she is, continue to push her teammates. "If she can do that we're going to have a very good season." FAVORITE TV SHOW: One Tree Hill, Grey's Anatomy. FAVORITE CLASS: Anatomy & Physiology. FAVORITE PLACE YOU VISITED: Alaska. WHAT DO YOU DO TO RELAX? Outdoor Activities. FAVORITE SPORTS RIVALRY/ATHLETE: Divine Savior Holy Angels. MOST MEMORABLE SPORTS MOMENT: Defeating top-seeded Milwaukee King in overtime in regional her sophomore year. WHAT WOULD YOU LIKE TO DO IN THE FUTURE? Attend college. Major in Business.